There's technically a few weeks of summer remaining, but Labor Day weekend is the three-day stretch that unofficially marks the end of summer fun. There's no better way to see out one of the year's top four seasons (and enjoy the celebration of organized labor) than to eat some damn-good food. Especially if said damn-good food is free. Grilling out and big meals with friends are a hallmark of Labor Day weekend. But you can't eat in the park for every meal. 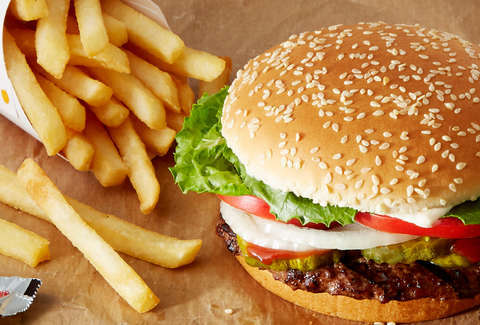 Fortunately, several popular chains -- Wendy's, McDonald's, Burger King, Dairy Queen, and more -- are offering tons of free food and other food deals over the course of the long weekend, so you can still eat well even when you're not consuming hot foodstuffs right off the grill. The deal: If you love food but find yourself wishing you could cram a tiny salad with bacon bits onto the edge of the plate, drop into Cicis. You can get a free adult buffet with the purchase of another adult buffet and a regular or large drink. The deal: Things are a bit weird at Papa John's chain after Papa John Schnatter resigned using a racial slur, later said he regretted stepping down, then accused the company of trying to silence him... but the pizza chain is offering a deal for buy-one-get-one free (BOGO) pizzas this Labor Day weekend. Order a pizza at regular menu price and you'll get another of equal or lesser value for free. Just use the promo code LABORDAY. The deal: First responders, active military, firefighters, police, and EMTs are being treated to a free ground beef or vegetarian taco. Just flash your ID and get a little something as a thank you for your service. The deal: The Golden Arches is offering a deal for free fries on Fridays, and $1 sandwiches any day from now through September 30. Find both deals in the McDonald's mobile app. The deal: Wander into any Baskin-Robbins and sample the Cappucino Blast -- coffee, milk, and ice cream -- for free all weekend. The deal: Buy an entrée and get a free slice of pie. Real simple. The deal: The pasta shop is offering a buy-one, take-one deal for a limited time. Buy any $12.99 lunch and get a second one to go and it's free. The deal: You're picking up a free medium sub with the purchase of a medium or large sub, chips, and a drink. The deal: Kids get a free meal over Labor Day weekend when they're with an adult who purchases an entrée. The deal: Buy a variety platter at regular price, get one for free with this coupon. The deal: If you're part of Quiznos Toasty Points program (the sub shop's loyalty program), you'll get 20% off any one order. The deal: Make an order on the coffee shop's website, and you'll land yourself $20 off every $100 you spend. Bonus: You may get a free case of the jitters after purchasing $100 worth of coffee. 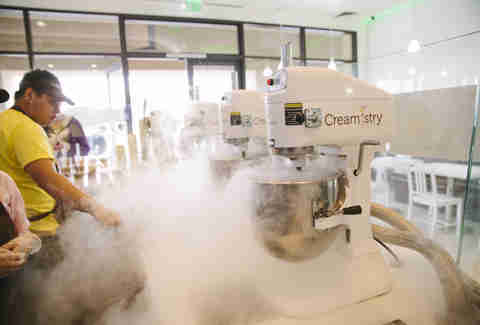 The deal: Show a student or school employee ID, and you'll get 20% off any of the shop's organic liquid nitrogen ice cream. It's like a high school science experiment you can eat. The deal: Celebrate the return of Panda town's Honey Sesame Chicken Breast with $3 off any online order of $5 or more if you use the code "HONEYISBACK." It's not free, but it's better than Bee Movie. The deal: Get your last gulps of rosé in before summer turns into a pumpkin and three white mice. Over Labor Day weekend, Anyday is offering 10% off an eight-pack of canned rosé, 15% off a 24-pack, and 20% off a 96- or 365-pack. The discount will automatically be applied at checkout after you've been confused for 20 minutes about how to activate the discount. The deal: The wine club is offering free shipping on a three-bottle End of Summer Pack with the code "LDWINE," which is a solid way to kick off a wine subscription. The deal: Delivery from Burger King is now a thing. To celebrate the partnership with DoorDash, you can get free delivery on orders of at least $15 all weekend. The deal: Members who receive the pizza chain's email offers can expect to receive a unique promo code for 40% pizza orders of $20 or more for the holiday weekend. The deal: It's not for Labor Day, but Red Lobster has announced that Endless Shrimp is back. The deal: Every day this month, the neighborhood bar and grill is offering $2 Sam Adams OctoberFest beers. The deal: Forget about the labor coming up on Tuesday with all-day happy hour. Drink specials and half-off appetizers in the bar area will be available all day long. The deal: Take $10 off an order of at least $40 with the code "10OFF40" or this coupon. The deal: If you're ready to take on homebrewing, you can get 20% off brewing equipment with the code "BEERSALE." The deal: The subscription box company is offering 20% off on a ton of new subscription boxes with the code "CJLABOR20." 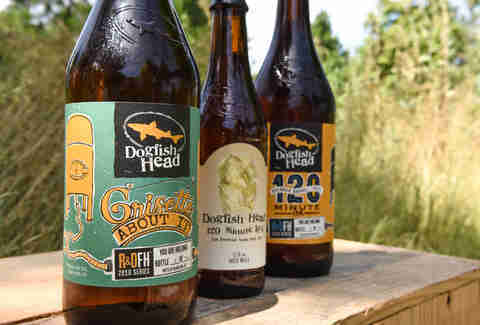 The deal: In celebration of labor and worker rights, Dogfish Head will be releasing three limited-run beers, two of which were bottled by hand. Visit the Milton Tasting Room on Friday to pick up the fall release of 120 Minute IPA and a special hand-bottled Bourbon Barrel-Aged 120 Minute IPA, but be careful with the later. It clocks in with a whopping 17% ABV. On Saturday, you can grab a 750 ml bottle of Grisette About It!, which was also hand-bottled. The deal: If you're grilling out over Labor Day weekend and feel totally clueless, Longhorn is offering a free service to turn you into the Emperor of Charcoal. The restaurant's Grill Us Hotline has "grill masters" standing by to offer free advice. Call 1-855-LH-GRILL through 4pm EST to get a hand. If you know of Labor Day freebies and deals we missed, email us at news@thrillist.com and we'll add 'em here.